Aquaponics is the practice of raising fish and plants in recirculating systems where the fish provide nutrients to the plants and to beneficial bacteria, which then cleanse the water of organic matter and nutrients and return it back to the fish. It’s a highly productive ecosystem with many extraordinary benefits, most notably its ability to conserve water using minimal, if any, discharge. 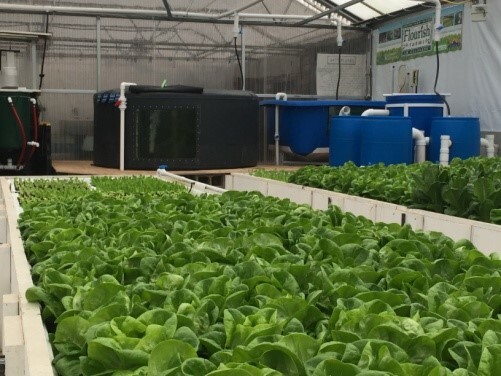 While there’s plenty of information out there about the benefits of aquaponics, let’s talk about some specifics regarding aquaponic system design that could be particularly useful in mitigating some of the risks and challenges often found in aquaponics. To provide some context and scale, I’m using my aquaponics facility, Flourish Farms, which occupies a 3,200 square foot greenhouse. However, these ideas are applicable to systems of any scale. Our aquaponics farm is designed with the flexibility to run in a “decoupled” mode wherein the fish system can be operated independently of the hydroponic plant system. In normal operation, the water from the fish tanks flow through a series of filtration tanks and then out into the hydroponic system. A single pump returns the clean, filtered water back into the fish system. In decoupled mode, water from the fish tanks flows through the filtration system as it does in normal operation, but it doesn’t pass into the hydroponic troughs, rather it returns back to the fish tanks via a separate line. The filtration, or life support, system (LSS) is designed to provide the proper mechanical and biological filtration necessary to support appropriate water quality for the fish. When the fish system is running on its own loop, the hydroponic system can also continue flowing via its own pump. In our farm, water is pumped from the last deep-water culture trough back to the first trough, maintaining a continuous flow through all four troughs. Power failures and a lack of good backup, monitoring and alerting systems. Loss of water due to blockage, overflow, rupture or an operator error. Poor temperature control and water quality management. Variability in temperature can be highly stressful on fish, and if you’re not able to properly control temperature, fish may stop eating. This can affect the nutrient dynamics in your system. Fish disease can also creep up quickly if the temperature, water quality and health of the fish are not being regularly monitored, or if you’re not quarantining fish upon arrival from other sources. Another advantage of system decoupling is that hydroponic troughs (DWC) can be run at their own flow rates if so desired. In other words, when the entire fish and plant system is running in normal operating mode using a single pump, the hydroponic pump could be used to circulate water at a variable flow rate through the DWC troughs as well. This requires the running of two pumps, but if the aim is to increase the flow rate through the hydroponic troughs, then the separate DWC pump and plumbing gives the operator the ability to do so. This could be beneficial if water flow rates through the troughs are too low. Deep Water Culture troughs, fish tanks and filtration system. Image via Colorado Aquaponics. 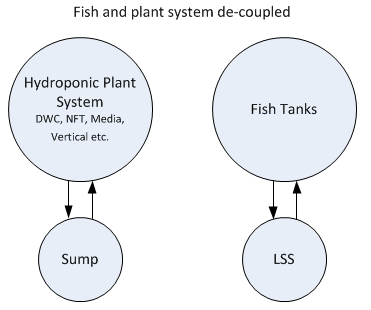 Other reasons for having a decoupled system include the fact that you can cycle your fish system independently while growing plants in your hydroponic system. Or perhaps you started as a hydroponic grower and you wish to add on an aquaculture component later in the cycle. Another popular design is to keep your fish system in a separate facility, or “head house,” and your plants in a greenhouse. The two systems can still be hydraulically connected so that the fish water can be delivered to the plant system, but not necessarily be returned to the fish house. Water quality parameters can also be managed independently and optimized for each system. For example, fish tend to like a higher pH and plants like a lower pH. Temperature could also be managed independently depending on the location, environmental controls, fish species etc. When reconnecting the two systems, it’ll be important to ensure that the ammonia and nitrite compounds have been fully oxidized and exist at safe levels for the fish. Water temperature, pH, Alkalinity and other factors affecting water quality might not be properly aligned between the fish and plant system, so adjustments to these levels may be necessary to make a seamless transition and minimize stress on your fish. Other elements in the hydroponic nutrient solution could be problematic for the fish if found at certain levels. For example, we raise hybrid striped bass, which are sensitive to potassium. It’s always important to do your homework when you’re considering adding something to your aquaponics environment. Diluting the solution or exchanging it with fresh water may be required to help reduce any potential toxicity, and to allow you to safely reconnect both environments. 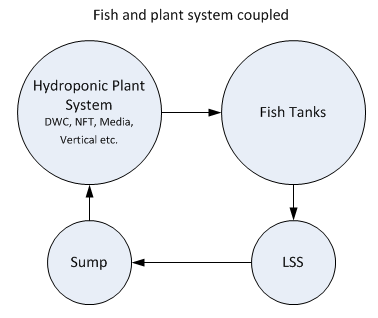 As is often the case in commercial aquaponics, the majority of the revenue is in the plants, so having your plant system entirely dependent on your fish system creates a single-point-of-failure scenario, which can be avoidable in a decoupled system. 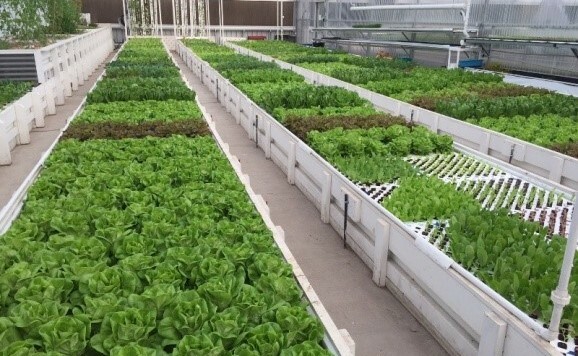 If you have an issue with your fish system for any of the reasons cited above, you can still continue to run your hydroponic system on an organic nutrient solution so that you’re able to maintain your production crop, your customers, and your revenue stream. For upcoming classes and workshops, visit Colorado Aquaponics. For the latest updates and posts, like us on Facebook and Twitter. 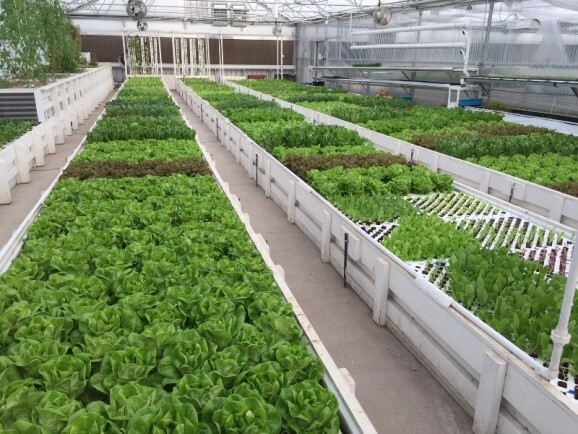 Images via Colorado Aquaponics.Featured Image: Indoor Aquaponic Farm. Image via Colorado Aquaponics.